“ReStore”, Habitat for Humanity’s non-profit home improvement donation center, recently opened its first ReStore located along Alabang-Zapote Road, Las Piñas City. The center is managed by Habitat for Humanity Philippines. ReStore offers the general public new and slightly used furniture, home accessories, building materials and appliances that are donated by individuals or groups to Habitat for Humanity. All proceeds from ReStore help in the building of decent and affordable homes, communities and hope. ReStore is a venue in which kind-hearted homemakers can find almost everything that they may need as well as donate their pre-loved appliances and furniture to fund Habitat’s advocacy. It also serves as another avenue in which everyone can be part of the solution in nation-building. “Its concept is similar to retail; but ReStore is not really retail. It’s purely a donation center. ReStore is a place where people can donate and donations can be in the form of items voluntarily given or in cash in exchange of an item that a person buys from the store. It’s just one of the many opportunities where people can be part of building homes and part of nation building”, says Francis Macatulad, Head of Volunteer Programs and ReStore for Habitat Philippines. Habitat affiliates from other countries such as the United States, Canada, Australia and New Zealand have also established their own ReStores to raise additional funds. Habitat ReStore now has about 1,000 outlets all over the globe. Habitat Philippines ReStore is located at Lot 2, Block 1, G-3 Alabang-Zapote Road, Almanda Uno, Las Pinas City. 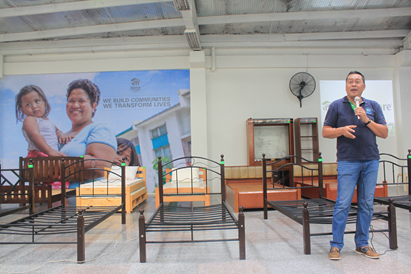 To donate your furniture or volunteer your time, please email restore@habitat.org.ph or call 0927-572-0887 or 0908-727-3377. It's wonderful to see Habitat for Humanity getting more facilities up as a solution for the less fortunate. Here's hoping that more people are able to benefit from the new building!